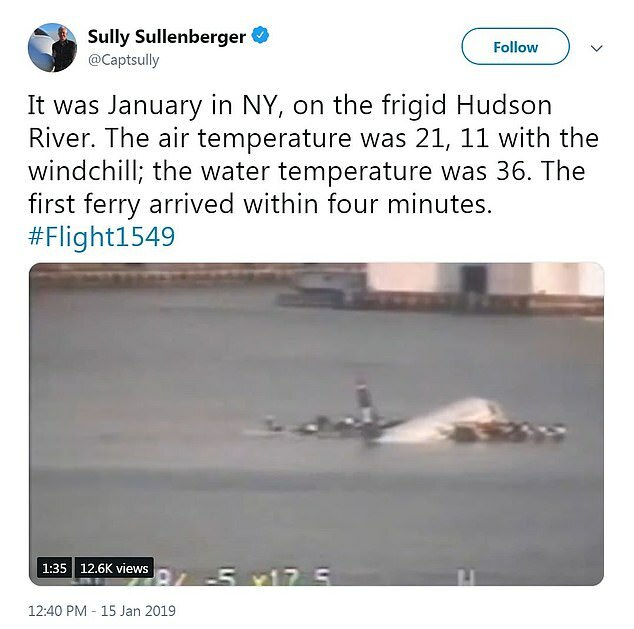 In posts prepared ahead of time, Captain Chesley ‘Sully’ Sullenberger tweeted the events of the day he landed US Airways Flight 1549 in the Hudson River after double engine failure, as if he were reliving those events in real time on the 10 year anniversary of the great feat. Capt. 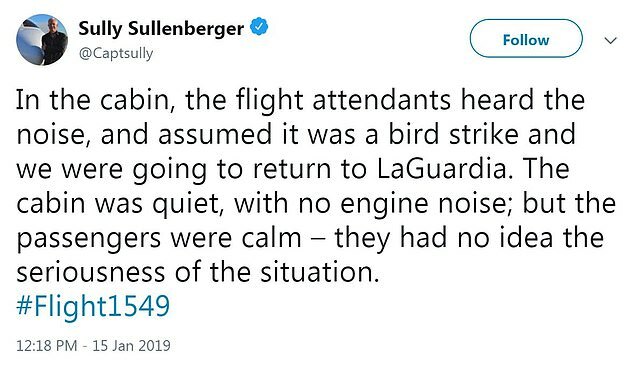 Sully helmed the controls on January 15, 2009, as the plane he piloted collided with a flock of geese after takeoff from New York City’s LaGuardia Airport, shortly after 3pm Eastern. 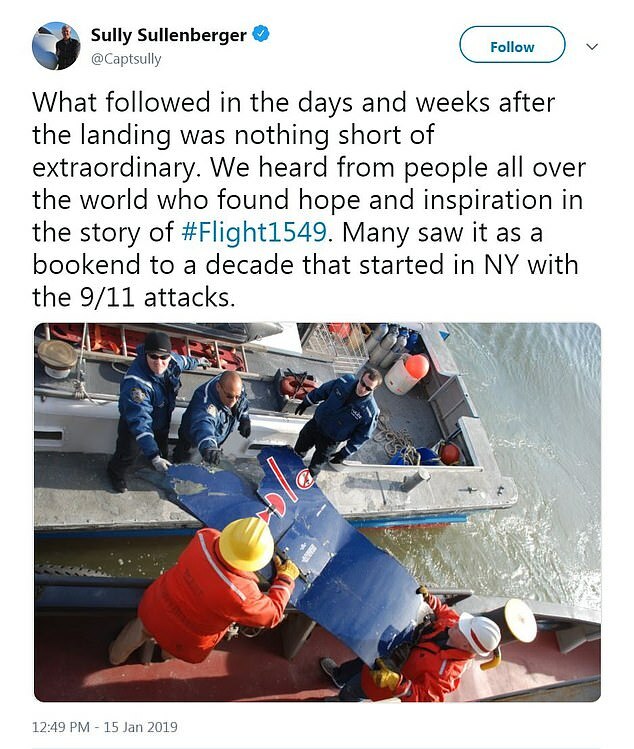 ‘#Flight1549 was completely routine and unremarkable – for the first 100 seconds,’ Sully wrote, as he relayed the event in extreme detail over on Tuesday over his Twitter account @Captsully, just as he lived it a decade ago in real time. 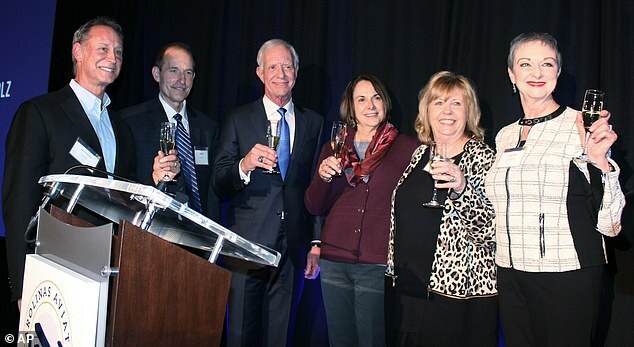 Some of those survivors, includng Sully, raised a glass on Tuesday in North Carolina, at the museum where the plane’s remains are on display, in celebration of living to tell the tale. 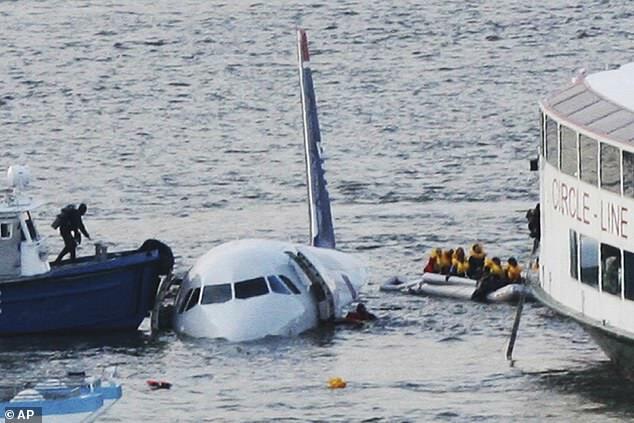 ’10 years ago today the lives of everyone on #Flight1549 changed forever,’ Sully began the long string of tweets. 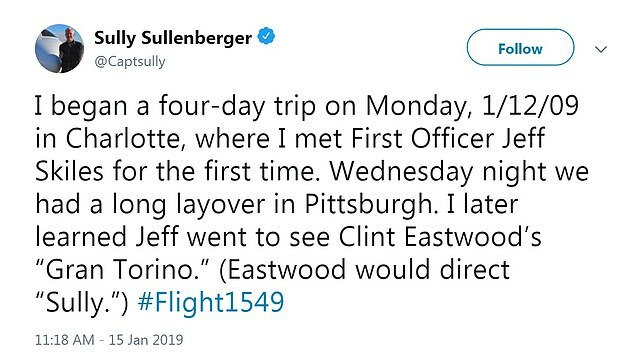 Sully wrote: ‘I began a four-day trip on Monday, 1/12/09 in Charlotte, where I met First Officer Jeff Skiles for the first time. 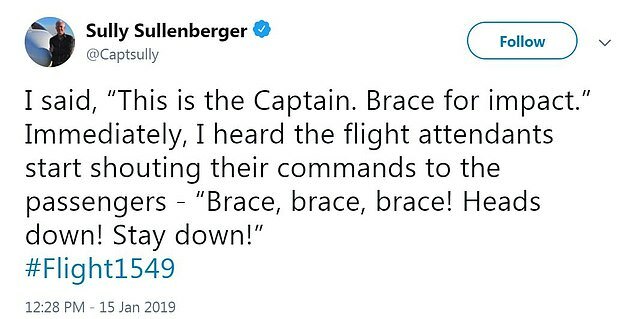 The Captain was referring to the movie about the incredible crash landing which came out in 2016, and saw Tom Hanks play the real-life hero. 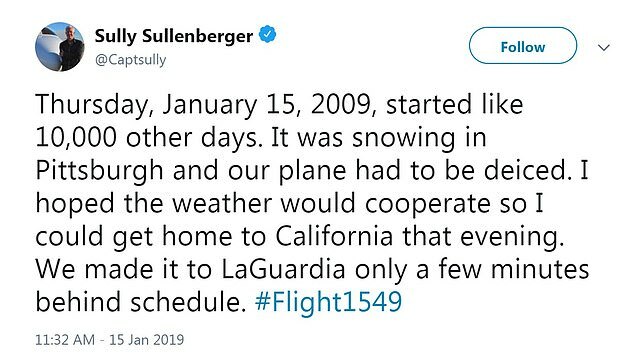 ‘Thursday, January 15, 2009, started like 10,000 other days,’ Sully continued. ‘It was snowing in Pittsburgh and our plane had to be deiced. I hoped the weather would cooperate so I could get home to California that evening. We made it to LaGuardia only a few minutes behind schedule. 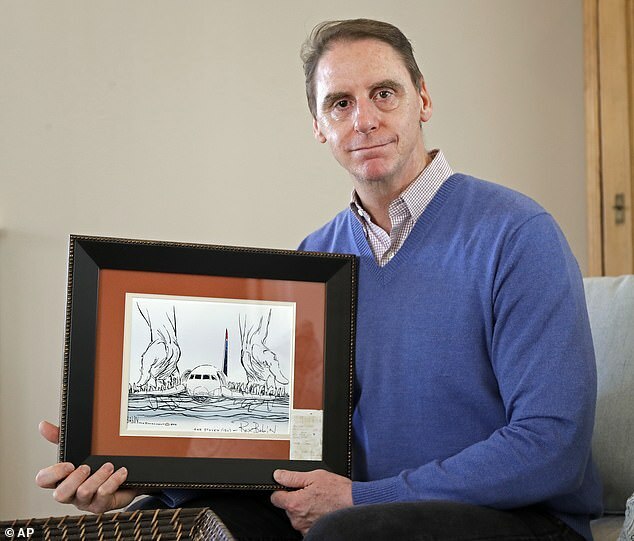 In this January 10, 2019 photo, US Airways Flight 1549 passenger Steve O’Brien poses for a photo at his home in Charlotte, North Carolina, with an editorial cartoon framed with his boarding pass from the flight that crash-landed in the Hudson River on January 19, 2009. 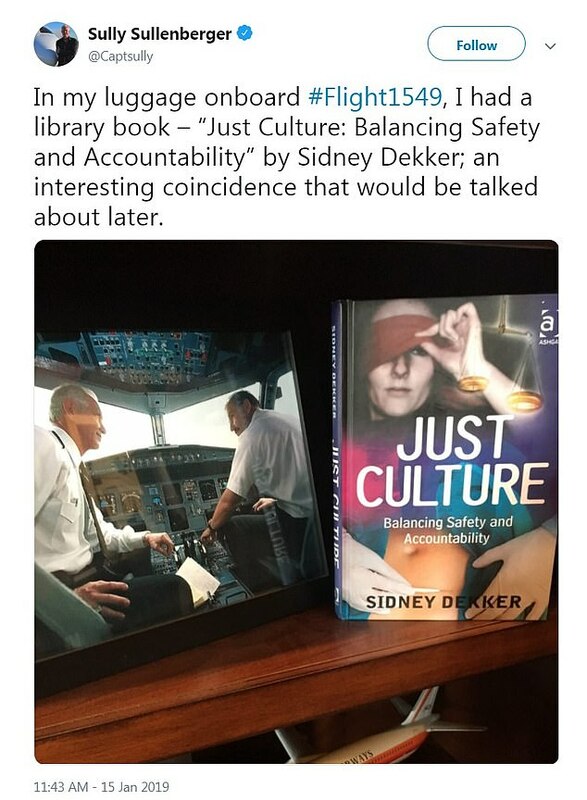 One of those later conversations occurred during questioning by the National Transportation and Safety Board, where Sully discussed pilot authority, corporate culture, airplane design and more, as detailed by NPR in November of 2009. 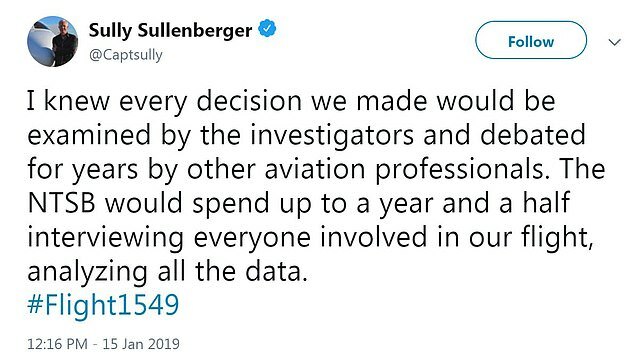 But those topics weren’t at the forefront of everyone’s mind on the anniversary of the crash, as Sully’s team posted his tweets. 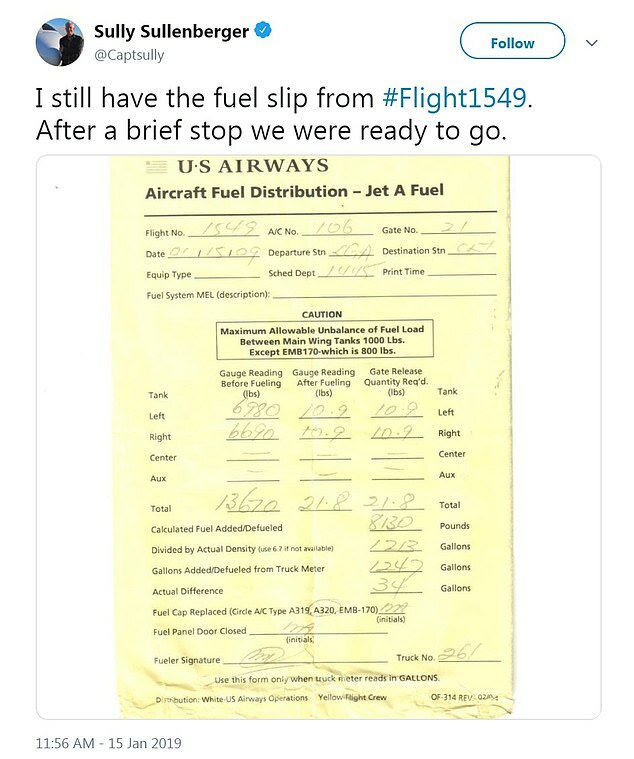 ‘I still have the fuel slip from #Flight1549. 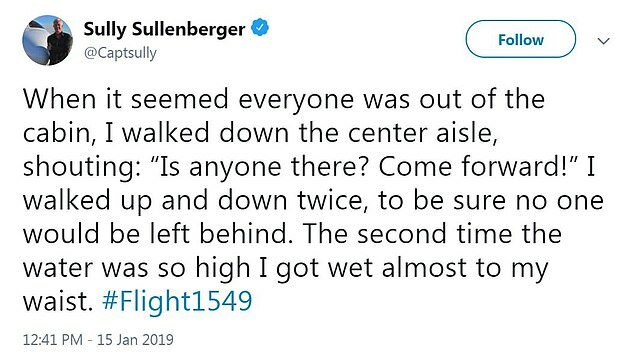 After a brief stop we were ready to go,’ Sully went on, adding military time stamps to subsequent tweets, which highlighted how quickly thinks began to unravel. 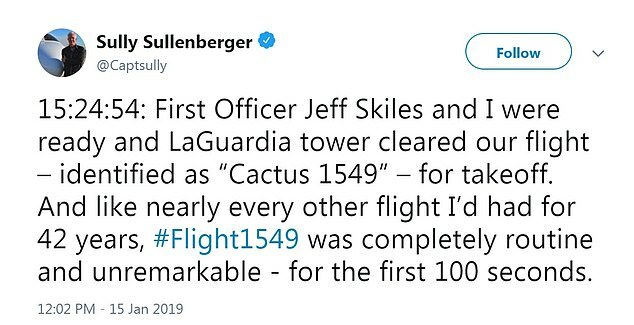 ’15:24:54: First Officer Jeff Skiles and I were ready and LaGuardia tower cleared our flight – identified as “Cactus 1549” – for takeoff. 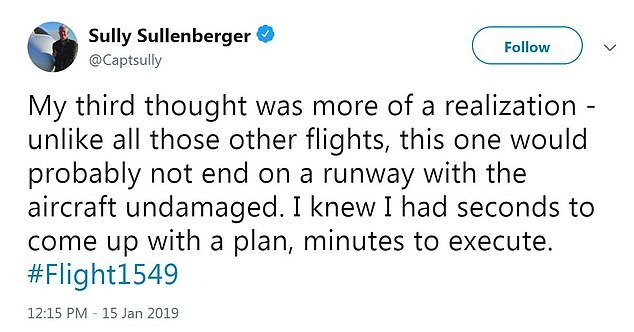 And like nearly every other flight I’d had for 42 years, #Flight1549 was completely routine and unremarkable – for the first 100 seconds,’ he said. And then, the moment everything changed happened. 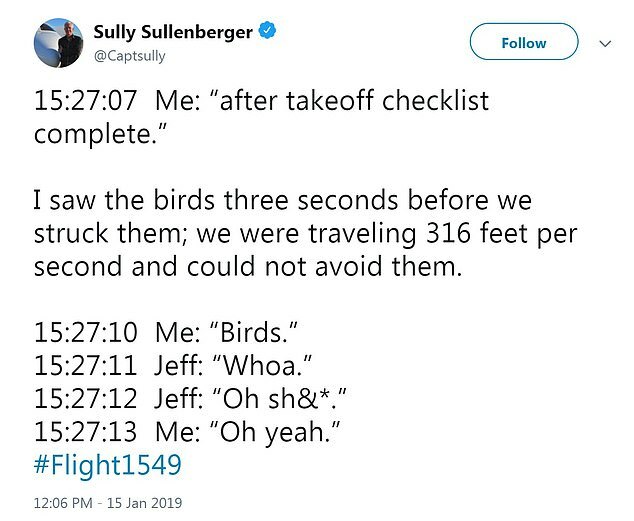 ‘I saw the birds three seconds before we struck them; we were traveling 316 feet per second and could not avoid them,’ Sully wrote. 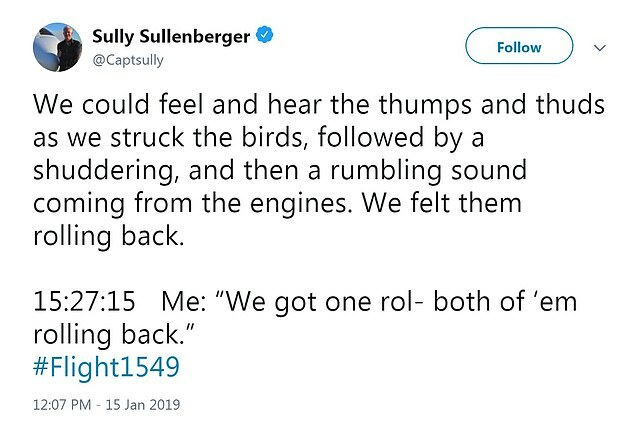 He continued: ‘We could feel and hear the thumps and thuds as we struck the birds, followed by a shuddering, and then a rumbling sound coming from the engines. We felt them rolling back. In aviation parlance, ‘engine rollback’ refers generally to engine failure to thrust, or an engine that is not responding to a pilot’s commands. ‘As the engines rolled back, they made the most sickening, pit-of-your-stomach sound, “whoooooooo” as they ran down. It was a sudden, complete, symmetrical loss of thrust. I had never experienced anything like it before,’ Sully wrote. ‘Within two and a half seconds, I had begun to take the first two remedial actions by memory. I turned on the engine ignition and started the aircraft’s auxiliary power unit. 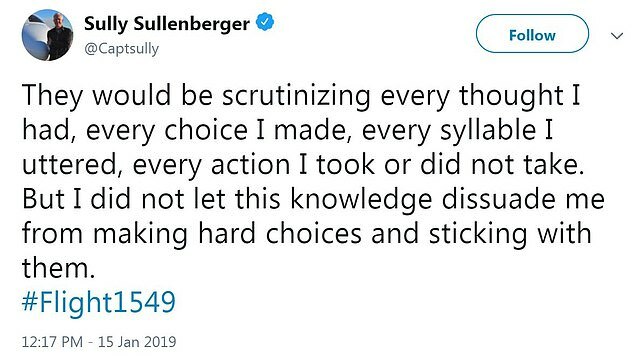 Sully went on to explain why he took that measure, almost involuntarily. ‘The engine ignition would allow the engines to recover if they could. 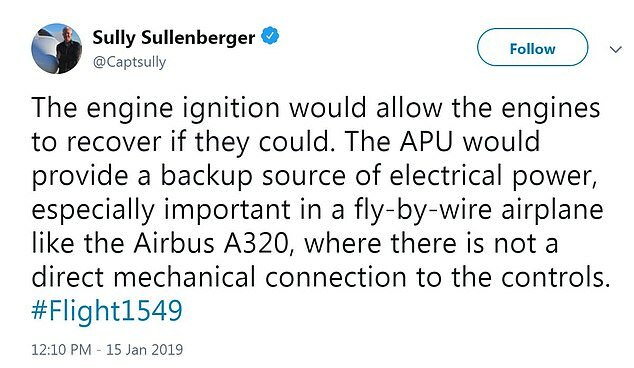 The APU would provide a backup source of electrical power, especially important in a fly-by-wire airplane like the Airbus A320, where there is not a direct mechanical connection to the controls,’ he wrote. The two worked together seamlessly, according to Sully’s account. 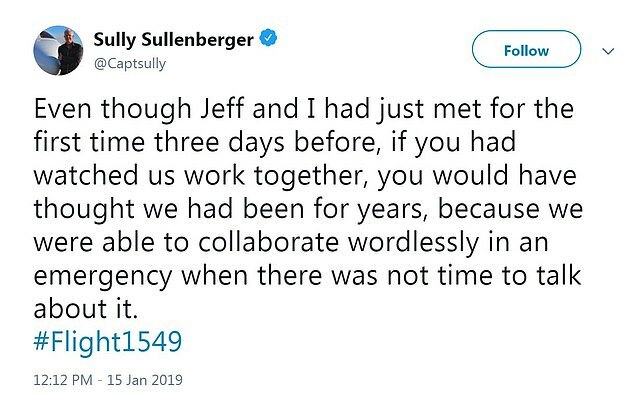 ‘Even though Jeff and I had just met for the first time three days before, if you had watched us work together, you would have thought we had been for years, because we were able to collaborate wordlessly in an emergency when there was not time to talk about it,’ Sully wrote. ’15:27:25: The cockpit area mic captured the sound of the igniters. 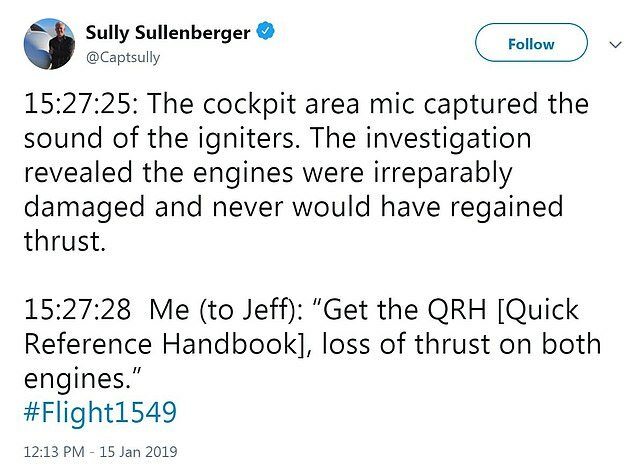 The investigation revealed the engines were irreparably damaged and never would have regained thrust. Sully relayed what was going through his mind as he realized his and his co-pilot would not be regaining control of their plane’s engines. ‘I still remember my first three thoughts,’ he wrote. ‘First, “This can’t be happening,” a very typical thought, rooted in disbelief. 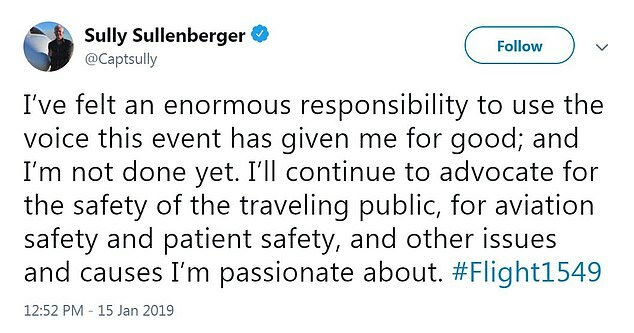 Second, “This doesn’t happen to me.” All my previous flights had been mostly routine. I had never been so challenged in an airplane that I doubted the outcome. 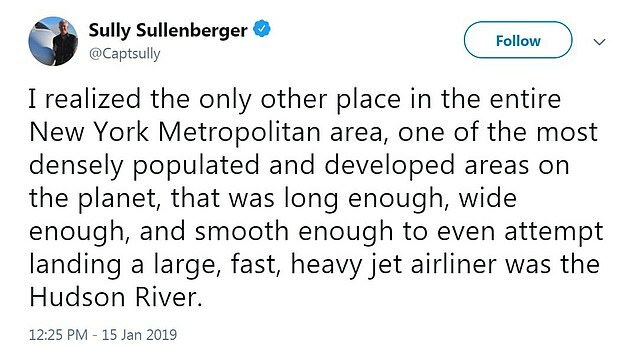 ‘My third thought was more of a realization – unlike all those other flights, this one would probably not end on a runway with the aircraft undamaged. I knew I had seconds to come up with a plan, minutes to execute. ‘I knew every decision we made would be examined by the investigators and debated for years by other aviation professionals. The NTSB would spend up to a year and a half interviewing everyone involved in our flight, analyzing all the data. ‘They would be scrutinizing every thought I had, every choice I made, every syllable I uttered, every action I took or did not take. But I did not let this knowledge dissuade me from making hard choices and sticking with them. 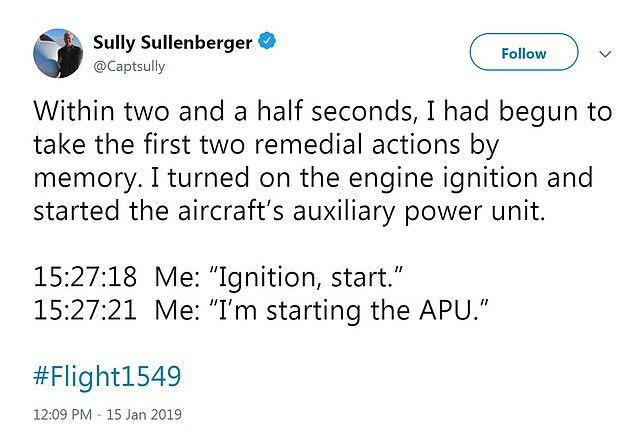 At approximately 3.27pm, Sully officially sounded the alarm. 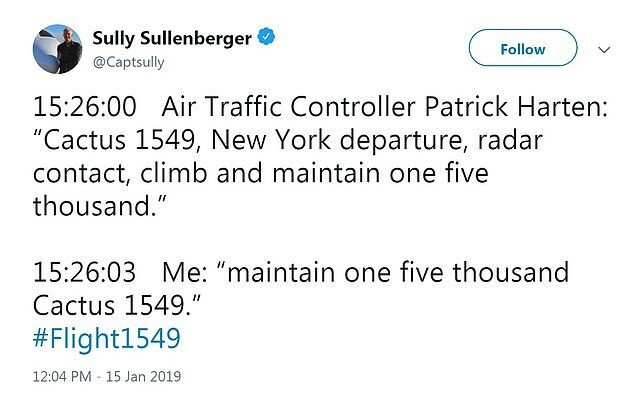 ‘Patrick immediately began to try to get us back to a runway at LaGuardia,’ Sully wrote. ‘Patrick was still determined to try to find a way to get us to a runway. I asked him about Teterboro off our right. He immediately began to arrange a landing there, but I quickly realized we couldn’t make it there either,’ Sully wrote. 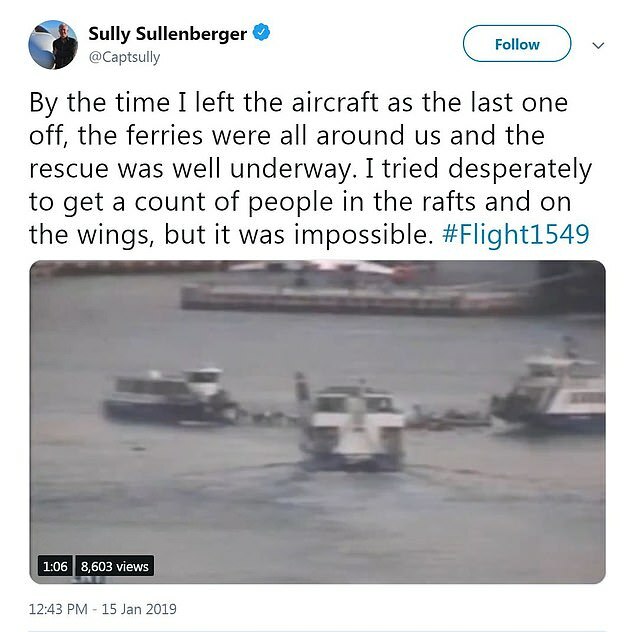 ‘I knew if I set the airplane down on the river and could keep it intact, the boats and ferries would come to our rescue. 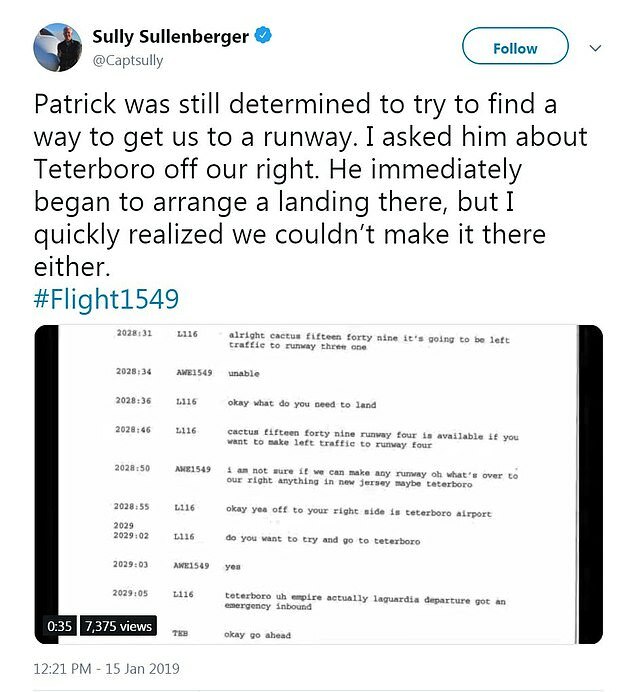 The uniqueness of the situation was not lost on Sully, or Patrick, in that moment. ‘This was a novel event that we had never trained for,’ Sully wrote. ‘In our flight simulators it was not possible to practice a water landing. Yet, I was able to set clear priorities. I took what I did know, adapted it, and applied it in a new way to solve a problem I’d never seen before. ‘We did not have enough altitude and speed (total energy) to make it to any runway, so I engaged in goal sacrificing. I was willing to sacrifice the airplane to save lives. 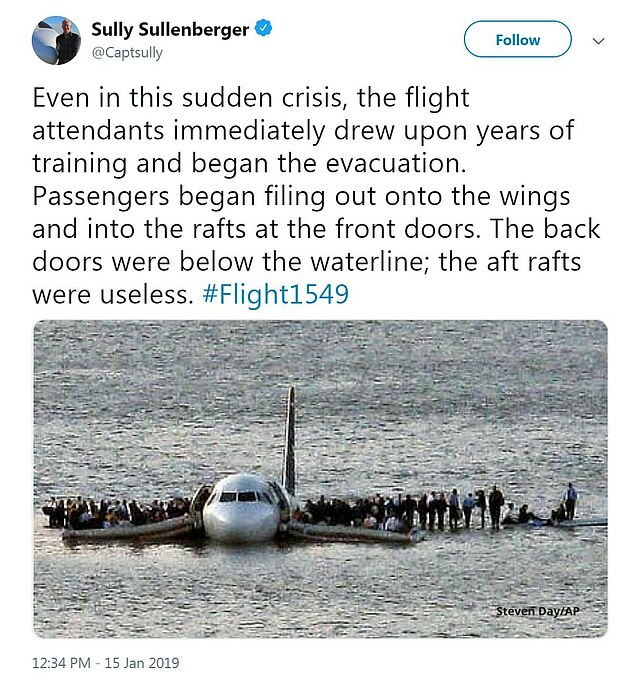 While Sully was sorting through all of this in his mind, the passengers and crew remained relatively in the dark about what was happening at the front of the aircraft. 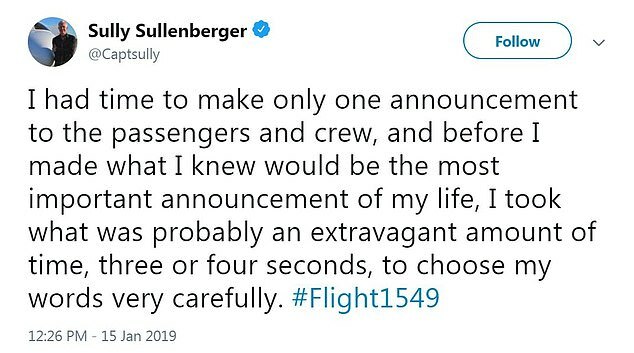 ‘I had time to make only one announcement to the passengers and crew, and before I made what I knew would be the most important announcement of my life, I took what was probably an extravagant amount of time, three or four seconds, to choose my words very carefully,’ Sully wrote. ‘I wanted to sound confident because I knew courage can be contagious. In our aviation vocabulary there are certain single words that are rich with meaning. 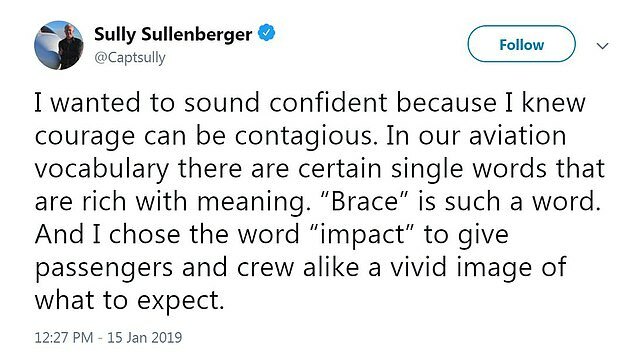 “Brace” is such a word. And I chose the word “impact” to give passengers and crew alike a vivid image of what to expect. As this was happening, the automated alarms from within the plane began to go off. 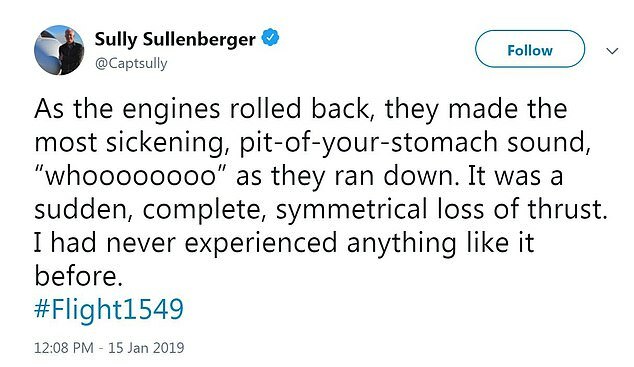 ‘The cockpit warnings were sounding,’ Sully wrote. 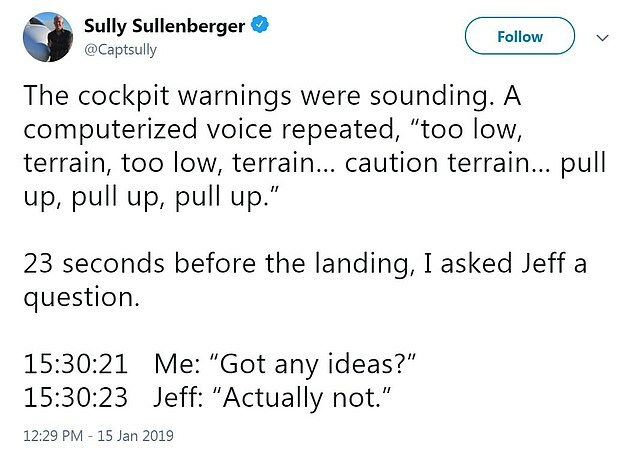 ’23 seconds before the landing, I asked Jeff a question. ‘I was asking him what else we could do to save lives,’ Sully explained. 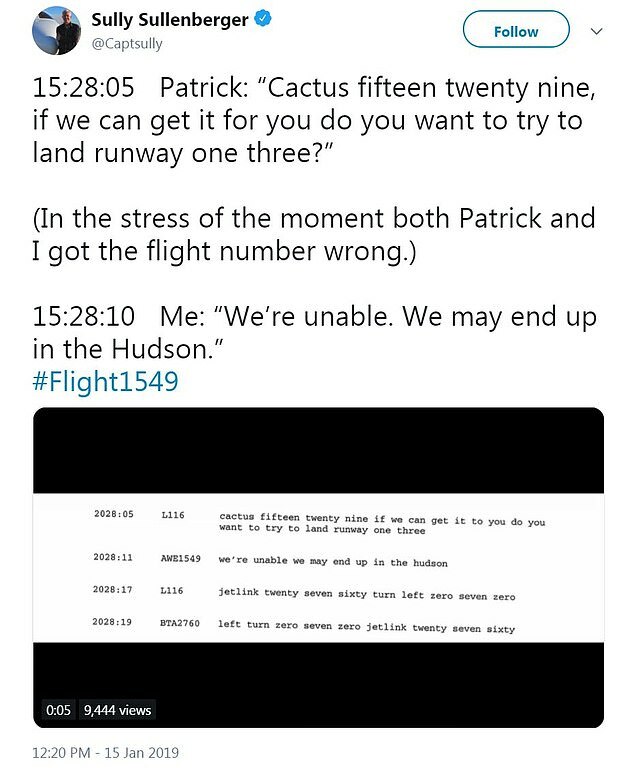 ‘That we could have this exchange in middle of such a crisis is just an indication of how well we had learned our team skills at the airline. 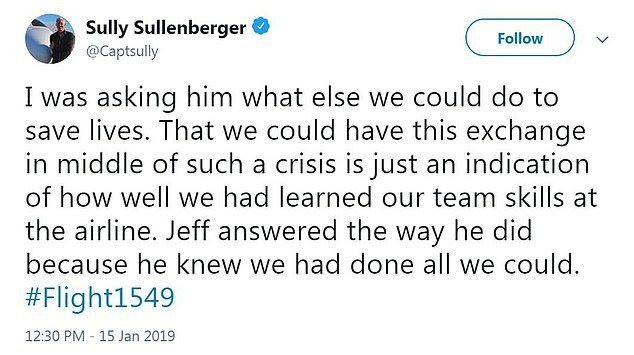 Jeff answered the way he did because he knew we had done all we could. 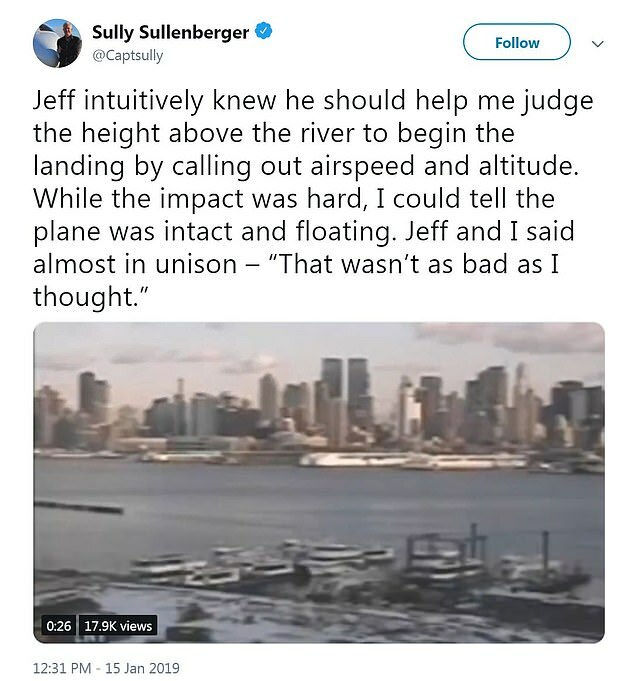 ‘Jeff intuitively knew he should help me judge the height above the river to begin the landing by calling out airspeed and altitude. 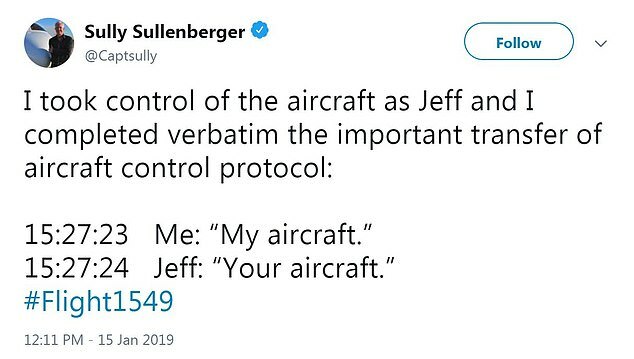 With the plane now out of the air, Sully and Jeff turned to the next issue at hand. 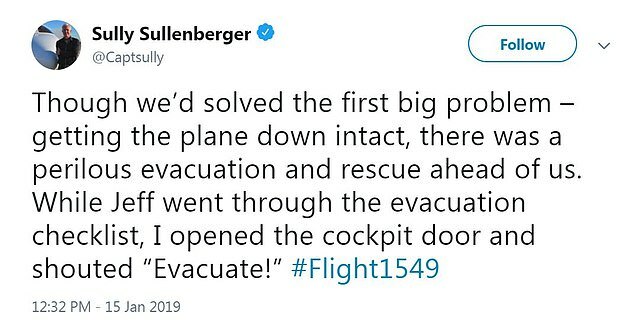 ‘Though we’d solved the first big problem – getting the plane down intact, there was a perilous evacuation and rescue ahead of us. 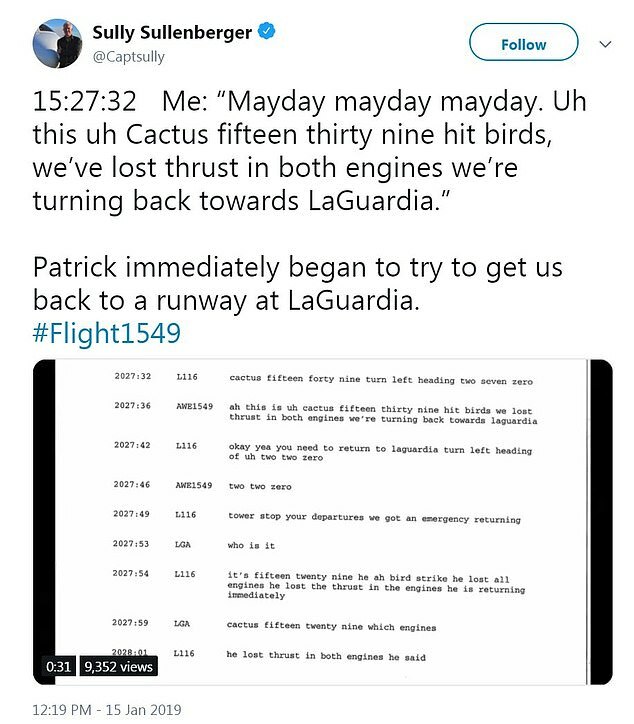 While Jeff went through the evacuation checklist, I opened the cockpit door and shouted “Evacuate!”‘ Sully said. The weather was also playing against them as passengers get out of the plane, but swift emergency responders helped the situation from turning deadly. ‘It was January in NY, on the frigid Hudson River. The air temperature was 21 [degrees Fahrenheit], 11 with the windchill; the water temperature was 36. 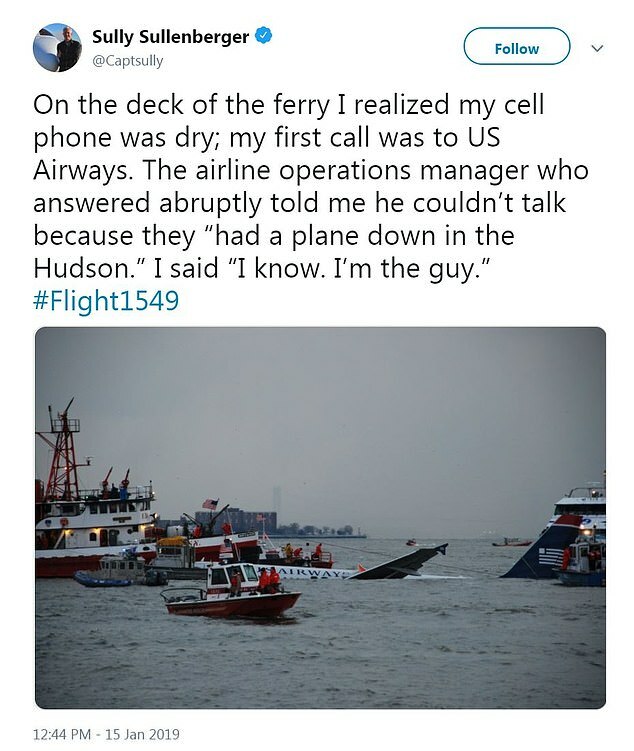 The first ferry arrived within four minutes,’ Sully wrote. ‘When it seemed everyone was out of the cabin, I walked down the center aisle, shouting: “Is anyone there? Come forward!” I walked up and down twice, to be sure no one would be left behind. The second time the water was so high I got wet almost to my waist. ‘By the time I left the aircraft as the last one off, the ferries were all around us and the rescue was well underway. I tried desperately to get a count of people in the rafts and on the wings, but it was impossible. 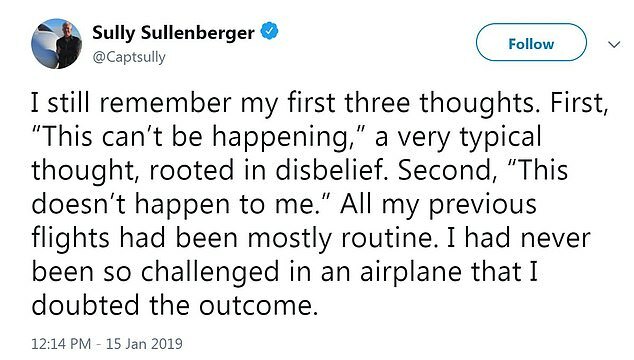 Then, Sully’s had time to take stock of what this meant to him, personally, aside from his role as the pilot in the emergency landing. ‘For the first time I thought about my own family. I called Lorrie to tell her the shocking news. She wasn’t aware of it. I told her I was ok, couldn’t talk, but would call her again later, as I had duties to perform. 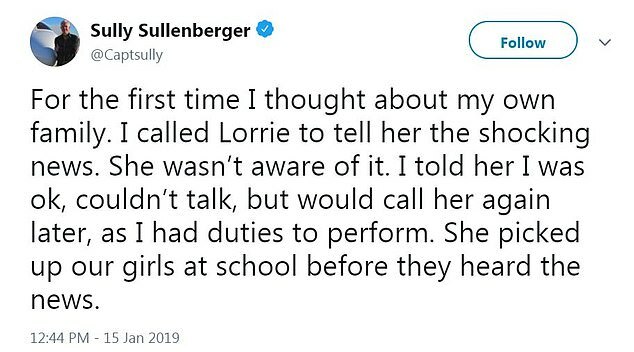 She picked up our girls at school before they heard the news,’ Sully wrote. Afterward, Sully shared a few reflective posts on the larger meaning of the events of that day. ‘What followed in the days and weeks after the landing was nothing short of extraordinary. We heard from people all over the world who found hope and inspiration in the story of #Flight1549. Many saw it as a bookend to a decade that started in NY with the 9/11 attacks,’ Sully wrote. 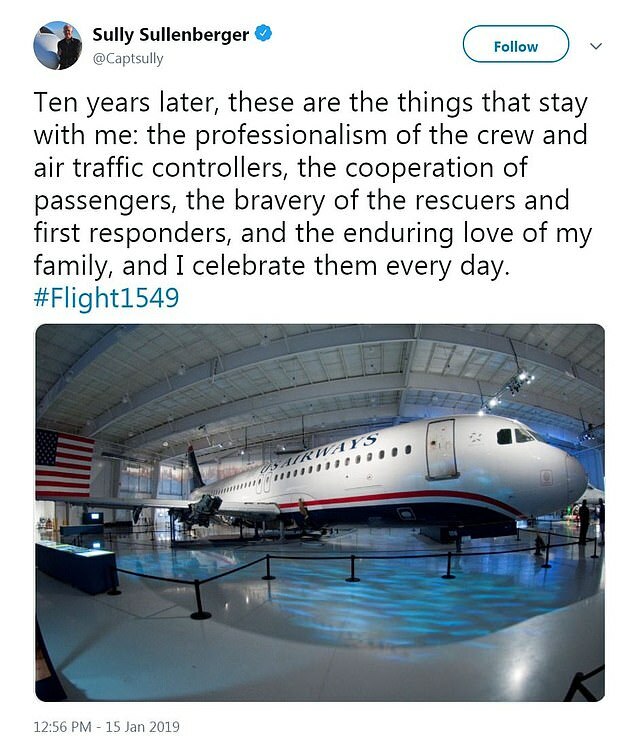 He continued: ‘Ten years later, these are the things that stay with me: the professionalism of the crew and air traffic controllers, the cooperation of passengers, the bravery of the rescuers and first responders, and the enduring love of my family, and I celebrate them every day. 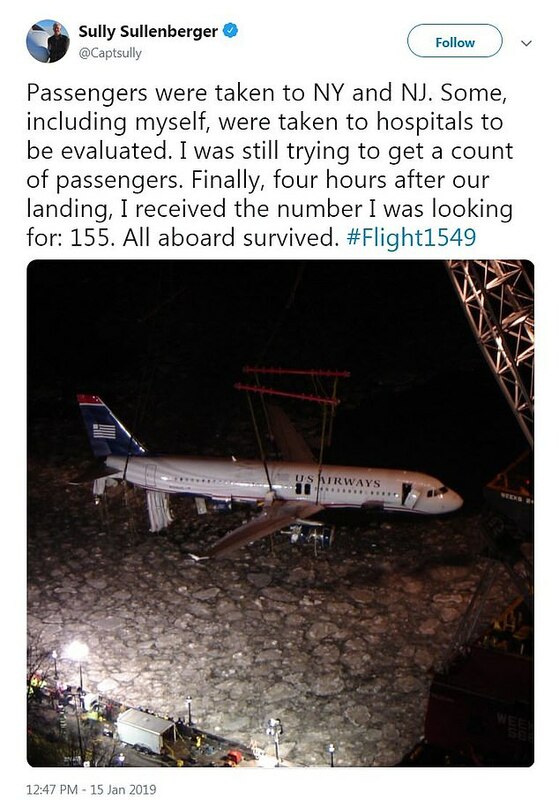 The posts had to be prepared in advance, because survivors, including Capt. 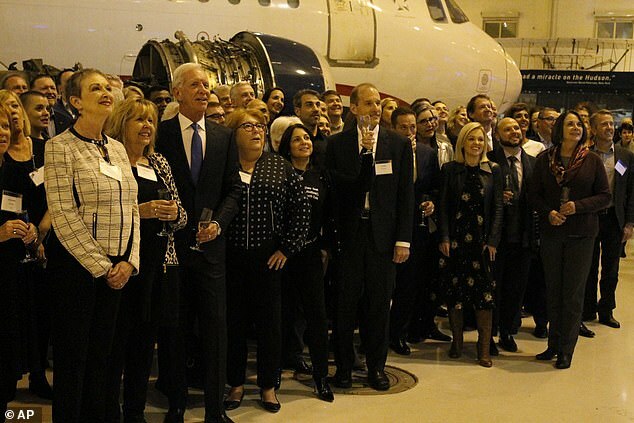 Sully, gathered on Tuesday at the Carolinas Aviation Museum in Charlotte, where the flight was headed and where the damaged plane is now held. 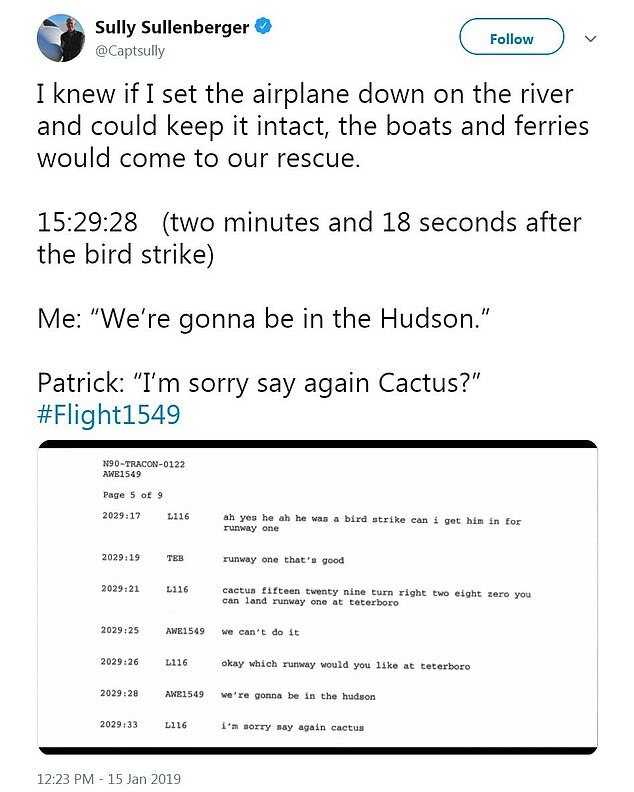 At 3.31pm, the exact moment the plane splashed down in the river 10 years ago, they shared a toast, with Sully counting down the last five seconds.